Annually the African Wildebeest go on a journey in search of greener pastures, much like we do. This migration, however, is not a simple errand to run. The exodus of animals is a result of the seasonal African rains. The migration is endless and has no particular starting point. This is because the captivating animals graze and reproduce in the process of this journey where life both begins and ends in a cycle. The Wildebeest migration is a beautiful process that arches from the Serengeti and Ngorongoro plains via western savannah woodland. Once the wildebeest have found their rhythm, they then head toward the north-west of Serengeti and the Mara. 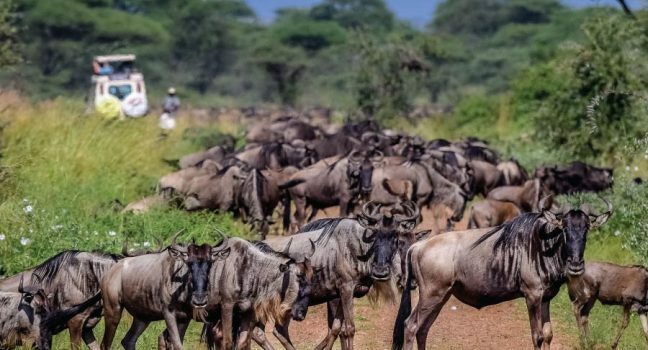 This is a captivating site for tourists who consider the Great Migration to be one of the most beautiful experiences to witness in the African savannah. In Africa, the WIldebeest migration occurs across Kenya and Tanzania. Kenya experiences the first rough, long rains in the months of late April, May and early June. Kenya has it’s cool season with little rain from the months of late June to October. The peak dry season occurs from December until March the next year. Tanzania enjoys very similar weather patterns as it borders Kenya to the south. 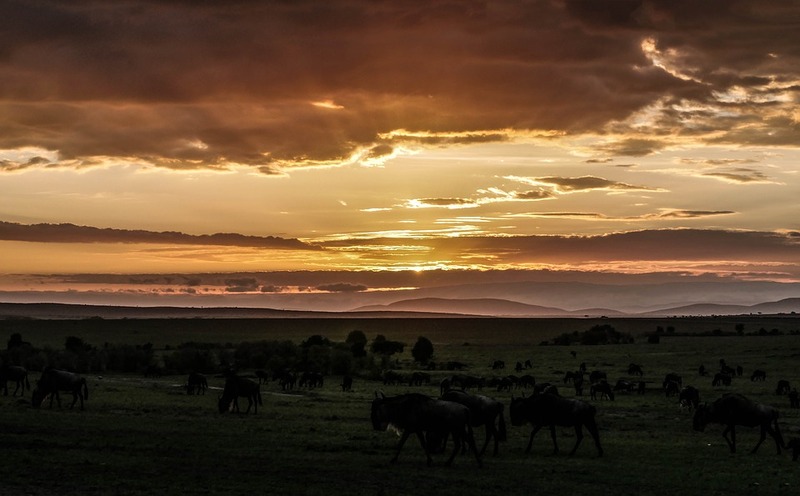 Visitors that come to witness the Wildebeest Migration want to experience the limitless freedom of the African plains, but also want to be assured about where they will be lodging during their time. Luckily, Kenya and Tanzania offer luxury lodgings that parallel the rest of the world. Expect rustic yet premium establishments with exceptional meals and a variety of drinks available that are included in your safari package. This will be arranged by your safari expert when you book your spot so make sure you inform them about any special dietary requirements. From a practical point of view, the essentials include anti-malaria medication, a set of warm clothes for chilly morning game drives and comfortable clothing and footwear. A hat or cap and sunscreen protects from the harsh African sun. Even on cloudy days, the sun can cause severe damage so take care of your skin. This is a special experience so binoculars to peer at wildlife and birds as well as a camera with spare batteries will keep your safari memories alive. The long rains start to fall in the month of January. This is the time when most female animals in the Serengeti reproduce. 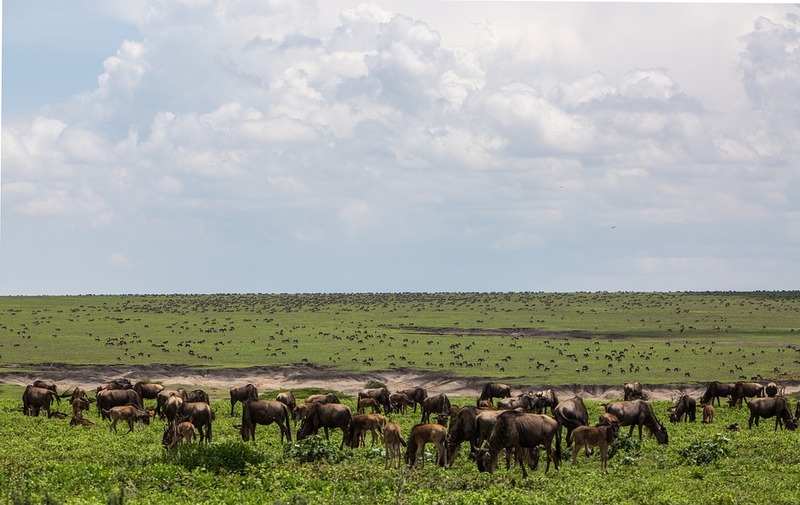 During the months of March up to April most of the wetlands dries up and this forces the animals, including the Wildebeest, to migrate towards Lake Victoria and the river deltas that provide life-giving water to the traveling herds. Remember that your safari expert will provide you with a wealth of knowledge about your destination to ensure that your experience is one worth looking forward to. Advice about the affordability of your safari, any special needs and possibly just someone to share personal anecdotes with are all the more reason to trust your trip to the experts.